There's a lot of buzz around whether foods are alkaline or acidic. The theory is that eating too many acid-forming foods and not enough alkaline foods changes the body's pH levels and leads to disease. The pH of milk is 6.7 to 6.9, making it slightly below neutral and therefore acid-forming. The exception is raw milk, which may be more alkalizing than pasteurized milk. Some nondairy milks are also acid forming, while others are alkalizing. While the pH of milk is 6.7 to 7.9, making it slightly acidic, raw milk and buttermilk are considered alkaline. Foods and beverages that have a pH of less than 4.6 are highly acidic, and foods with a pH of less than 7 are mildly acid-forming, according to Healthline. Although dairy and many nondairy milks are close to neutral — a pH of 7 — they are still said to contribute to acid formation in the body. 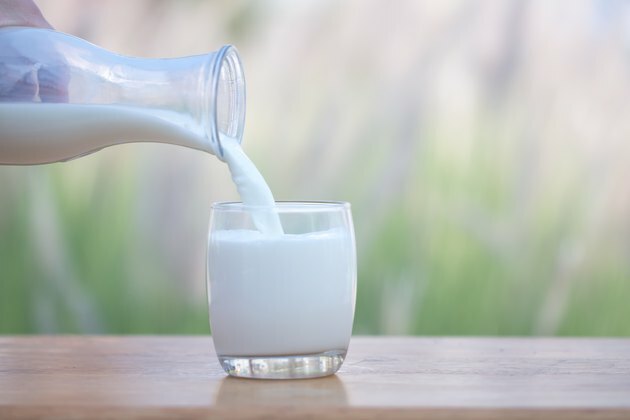 Raw milks — from cows or goats — are alkaline, according to the American College of Healthcare Sciences, although it's not recommended to drink unpasteurized dairy. Buttermilk is also alkalizing. Because grains are considered acid-forming foods, nondairy milks made from rice are also acid-forming. Soy is also highly acidic, according to Alkalife. Coconut and almonds are alkaline foods, so milks made from them may be alkalizing, depending on additives and processing. Sugar is highly acidic, and dairy and nondairy milks that are sweetened with it are more acid-forming than their unsweetened counterparts. Almond milk, which usually comes in a sweetened version, contains 13 grams of sugar per cup. Cow's milk also contains 13 grams of sugar per cup — however, it is the natural sugar lactose instead of the added cane sugar in sweetened almond milk. When you're trying to control your intake of acid-forming foods and beverages, the best almond milk is an unsweetened variety. That goes for all other nondairy milks, such as coconut, soy and rice. The popular alkaline diet proposes that acid-forming foods change the blood's pH levels, forming an acidic environment that promotes disease formation. Proponents claim that too much acid in the diet can lead to cancer, diabetes and high blood pressure, among other maladies. Although these foods are undeniably healthy for you, there is no evidence that their pH levels make any difference in the formation or suppression of disease, according to a 2015 review of research in the British Journal of Medicine. Even if the premise of the diet is inaccurate, the alkaline diet is still very healthy. Alkaline foods are full of vitamins minerals, fiber, fatty acids and other nutrients that promote good health. Eating plenty of these foods and eschewing acid-forming foods and drinks such as sugary, processed foods, fatty meats and alcohol will improve your health, lowering your risk of disease, helping you to maintain your weight, and keeping your blood pressure steady and your cholesterol levels low. However, trying to follow the alkaline diet, which advises cutting out healthy foods — such as dairy — takes a lot of extra effort, the benefits of which are not scientifically supported. Read more: What Should You Eat to Stay Healthy? British Journal of Medicine: The Alkaline Diet: Is There Evidence That an Alkaline pH Diet Benefits Health? Is Yogurt Alkaline or Acidic?